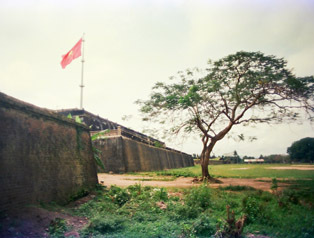 Hue, Vietnam's imperial city, was 76 k north. I arrived there at 1:10 in the afternoon, and struggled with accommodations. Hotels appeared to be everywhere, yet the city was bigger and much more impersonal than I had imagined. It wasn't clear to me where I wanted to be staying. Lonely Planet indicated that there was one hotel on the Citadel side of the Perfume river, and I decided to at least check its price out before compromising. The place was great. The proprietor asked $13 a night, and I jumped on it. I spent the rest of the day touring the famous wall and Imperial Palace. I was one day from the DMZ. I spent the next day figuring out how I'd get back to Saigon, once I made it to the old border. Buses and trains were available from Hue, but both would take 20 or 30 hours. Hue had an airport, but they couldn't take my bike. I learned that Da Nang had a daily Airbus flight to Saigon, which could take my bike, so I bought a ticket. I'd bike to the DMZ, get out to Khe Sanh somehow, then get back to Hue somehow, then get back to Da Nang somehow. Then I was home free! It was drizzling the next morning when I headed north. I'd started off early again, actually on the road at 6:10 a.m., in order to beat the headwinds I'd been warned about. The distance was only 72 k to Dong Ha, and I'd determined that I was maintaining a 20 k/hour pace on the flats. Sure enough, I was in Dong Ha by noon. I had either beaten the headwinds, or there weren't any. The drizzle hadn't stopped, and I was pretty muddy. I'd missed the organized minibus tours to Khe Sanh, the famous Marine combat base, but a motorcyclist expressed interest in taking me up, for ten dollars, if we got going immediately. I found a reasonable hotel for $13, put away my bike, and hopped on the cycle. I explained to my guide that I needed some sort of rain jacket, and we hit the local market. I picked up an ugly vinyl rain suit -- size extra large, for $7. A few hours later we're at Khe Sanh. I snap pictures and try to understand what it was like 27 years ago. Apparently 6,000 American soldiers were surrounded by tens of thousands of North Vietnamese troups for 75 days. We dropped 100,000 tons of bombs on the surrounding hills, eventually driving back the North Vietnamese. There's nothing to see now but barren red earth and front yards filled with recovered scrap metal, but the trip was still well worth it. I'm back in Dong Ha by the late afternoon, and, with the weather cold and wet, I hole up in my hotel room. The trip is over. It dawns on me, and it's sort of anticlimactic. I've made it to the DMZ. Although I'm bicycling back to Hue tomorrow, and I still have to figure out how I'm getting back to Da Nang for the flight, those are details. I've made it. The remarkable wall surrounding the old town. 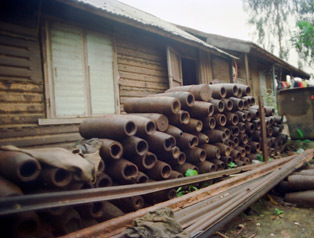 Even the intense fighting during the Tet Offensive could not destroy it..
War-scrap, collected for its recycle-value, was stacked against many of the homes in Quang Tri, the site of heavy fighting throughout the war.. 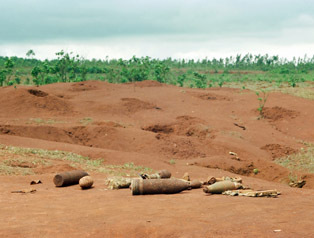 There wasn't much to see at Khe Sanh - except the holes dug by scrap collectors, and the few shells that they abandoned, because the danger was too great --even for them.